This recipe is perfect for those that like a spicy dish but don’t necessarily like the taste of mackerel. 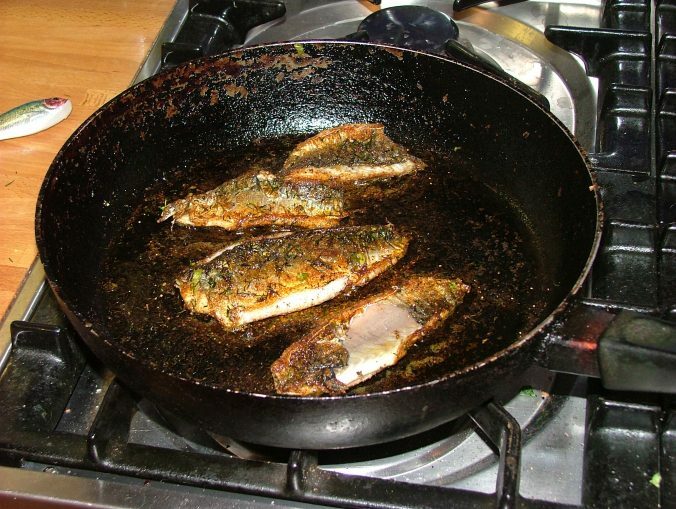 Blackened Fish is a Cajun style of cooking where fish fillets are rolled in spices then fried briefly in a searingly hot frying pan. This makes the outside crispy and the inside stays succulent. The fish will be fried in hot butter, but at a high temperature ordinary butter burns and goes black and nasty. Clarified butter can be made – you just melt butter and pour off the clear part to use, and throw away the white bits. Or you can buy it readymade in the form of ghee in the ethnic food section of a large supermarkets, or much cheaper in asian food shops. It keeps for ages in the fridge and can be used for any frying job, particularly when making curries. It really is this simple. Heat the ghee in a frying pan until it smokes. Mix the spices and spread out on a plate. Coat the fillets in the the spice mix on both sides. Put them in the frying pan, then after a minute or so, turn over and fry the other side. If the side you turned up is brown and crispy looking, a minute was fine. If not, give it a bit longer. Turn over and repeat. That’s all! Serve with whatever you like, I like new potatoes and french beans, but rice and sweet corn would be ethnic, or potato wedges. Drink plenty of cold beer with this and listen to some good Southern music, and wonder why you hadn’t eaten mackerel this way before.